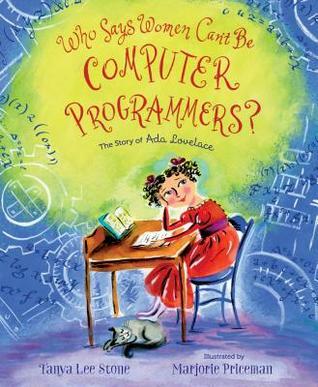 Raised by her single mother, Ada Lovelace is taught math and science are more important than the arts. However, as Ada grows and meets more people in the science field, she comes to realize that the two are harmoniously intertwined. This realization, along with encouragement from her friend and co-creator Charles Babbage, leads her to write several mathematical papers and come up with designs of what would eventually become the computers we have today. This book not only helps young girls and boys realize they can accomplish anything they put their minds to, but it also encourages them to use their imaginations and pursue what they love in life. The fascinating tale of the life of Ada Lovelace flows through each page with beautiful watercolor illustrations. The whimsical style brings life to her tale of imagination in a highly mathematical, science-based world. One page has a stunning image of Ada as a fairy with numbers for wings because she described picturing herself that way sometimes. The book also includes illustrations of a flying horse she wanted to create as a child. While monetary constraints prohibited some of Ada's ideas, putting those ideas into illustrations will encourage children to make their own dreams a reality. The vocabulary and content of this story is such that it will appeal most to grade-school children, but the story is appropriate for all ages.